Welcome to Mi Pho Song Vu! If you live in the Toronto or Hamilton area and often ask, “Is there Asian food near me?” you’ve found yourself in the right place. We are a family-friendly Thai, Vietnamese, and Chinese restaurant located at 2109 Jane Street, North York, Ontario. We’ve been open since 2007, and offer a variety of dining services, including dine-in, take-out, delivery, and even catering! You may be on the hunt for a delicious Chinese restaurant, but when you come to Mi Pho Song Vu, you’ll experience all types of Asian cuisine — Thai, Vietnamese, Chinese, and vegetarian options. It is our mission to provide our customers with not only the highest quality, best tasting Asian food in the Hamilton and Toronto areas, but to serve each and every individual who orders from us with the best possible customer service. Whether you choose to dine in with us, order delivery or takeaway, or even hire our catering services, you can rest easy knowing that you will experience consistent, quality, and friendly customer service along with great tasting Asian cuisine. So what types of cuisine can you expect from us? In our first blog post, we’re going to be providing you with an overview of our dining and menu options. You can find our menu on our site. For many of us, it’s easy to get a hankering for Asian food. From rice to noodles to meats, Asian cuisine can be very similar, and hands-down mouthwatering. However, what sets Vietnamese, Thai, and Chinese food apart from one another? Let’s find out! Vietnamese cuisine is distinct in the fresh herbs and vegetables that are used copiously in dishes. With a minimal amount of added fats and lots of fresh veggies, Vietnamese food is often light and healthy. Pho, a light noodle soup with broth and rice noodles, is a traditional Vietnamese dish that exemplifies the inclusion of light and refreshing herbs and vegetables in the cuisine. Bean sprouts are one of the vegetables that are consistently included in many dishes. What’s interesting about Vietnamese food is that, although it’s very unique and distinct in and of itself, it gathers a lot of inspiration from Chinese cuisine. The Chinese ruled in Vietnam for many years, so their ways of cooking were left behind, like stir-frying and steaming. Vietnamese cuisine also draws from the French with their use of onions and chilies. From refreshing Pho to beefy stews, you can’t go wrong with the fresh, delectable taste of Vietnamese cuisine. The culture of Thailand is ingrained in the cuisine, and vice versa. While many meals in the West consist of an appetizer, main course, and then dessert, Thai food does not — all dishes are presented and eaten in conjunction with one another. Traditional thai food is cooked around four main seasonings: sweet, sour, spicy, and salty. A good example of this is a Thai meal of fish, vegetables, noodles, soup, and fresh fruit for dessert. Rich in flavor and culture, you can’t go wrong when you order Thai food. For many Westerners, Chinese food is the first that comes to mind when thinking about Asian cuisine. While not the only type of Asian food available, authentic Chinese food is hands down delicious. Like most types of Asian cuisine, like Thai and Vietnamese, Chinese cuisine is rich in history and culture. From cooked and steamed meats, like pork, chicken, duck, and beef, to chow mein and dumplings, Chinese food is versatile and can range from rich flavors to more light and refreshing vegetable dishes. The great thing about Asian cuisine is that there are inumerous options for vegetarians. If you are not a meat eater, chances are you’ve turned to Asian vegetable and tofu dishes. 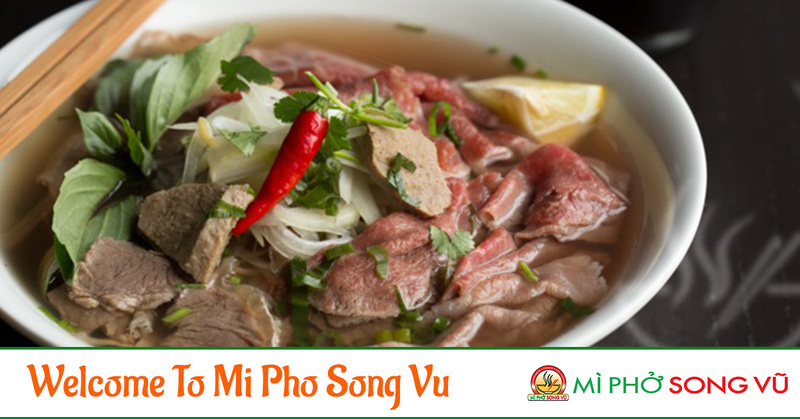 Here at Mi Pho Song Vu, we are proud to offer an authentic, versatile selection of Asian cuisine. Whether you are a meat eater or you are a vegetarian, our menu is ample. Our customers have no problem finding a tasty dish that they can enjoy individually or with a group of friends or family members. No matter the type of Asian cuisine you’re wanting, your craving will be satisfied at our Thai, Vietnamese, and Chinese restaurant. Download our digital menu. Come dine with us or place an order online. You won’t regret it — trust us.